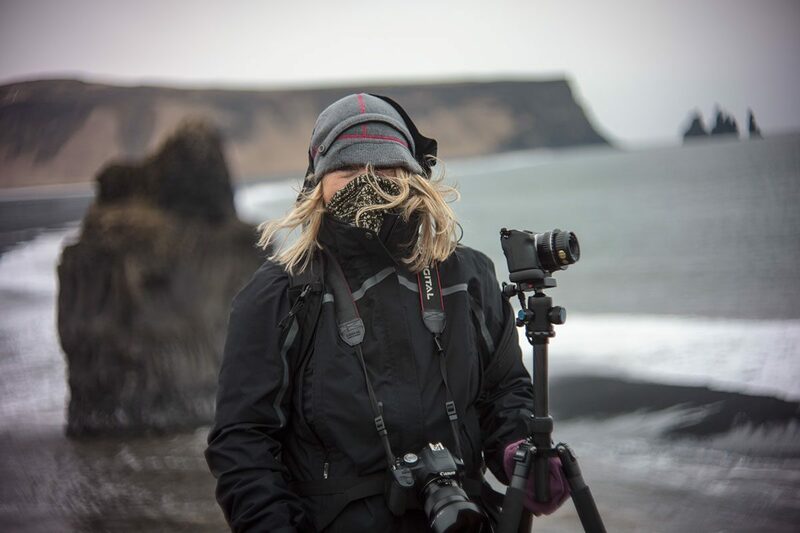 In March, Cathy Cone and I visited Iceland to photograph on the Southern tip of the island. The week’s weather looked good. We were expecting mild weather in the low to mid 30’s f. Light winds. No snow. We encountered an un-forecasted blizzard – not exactly rare for early March. But, it was focused solely on the area in which we were staying to about a 30 mile radius. We have photographed together two years in a row in the rain forests of the Pacific Northwest during December & January. Photographing the landscape in cold wet rain for hours is significantly easy in comparison to what we encountered in Iceland. In general, we encountered some of the most harsh conditions we have ever faced photographing – or simply walking in nature. There were a few moments in which we almost lost Cathy and we almost lost me. I have no idea where we would have been blown to or swept away to. 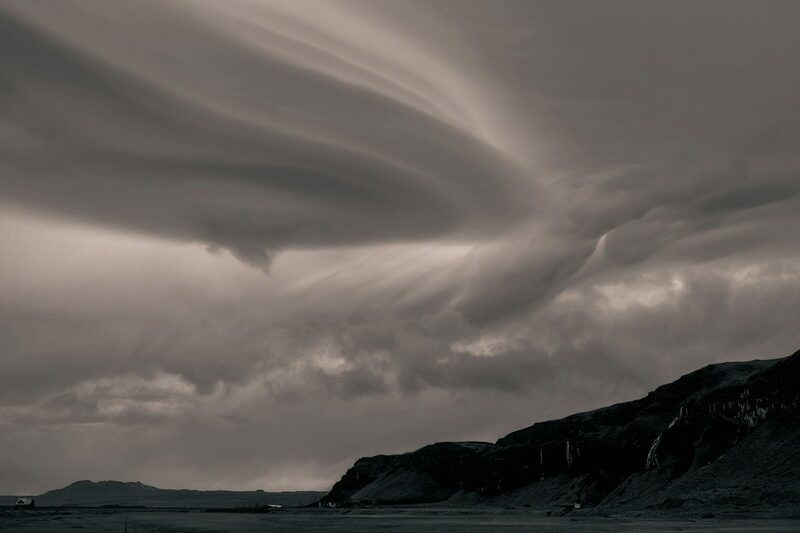 On the other hand – it is weather that often makes for the best photography. 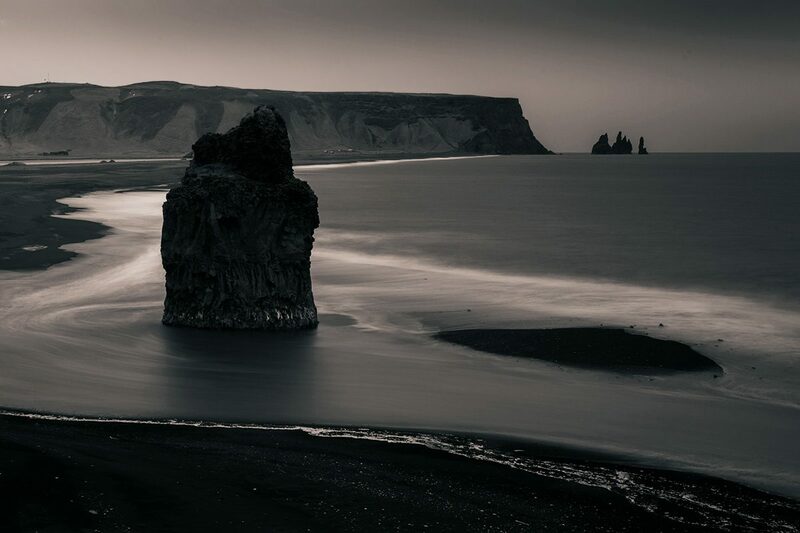 Our first day of shooting was directed at the beach near Vik. We have no idea where the strong wind suddenly came from. The ambient temperature was 24f/-4c but the wind chill reduced it to 3f/-17c. It was numbing to any fingers exposed for working camera controls. It was numbing to the eyes and cheeks. The use of a tripod for time exposures was difficult at best because the wind was simply too strong. 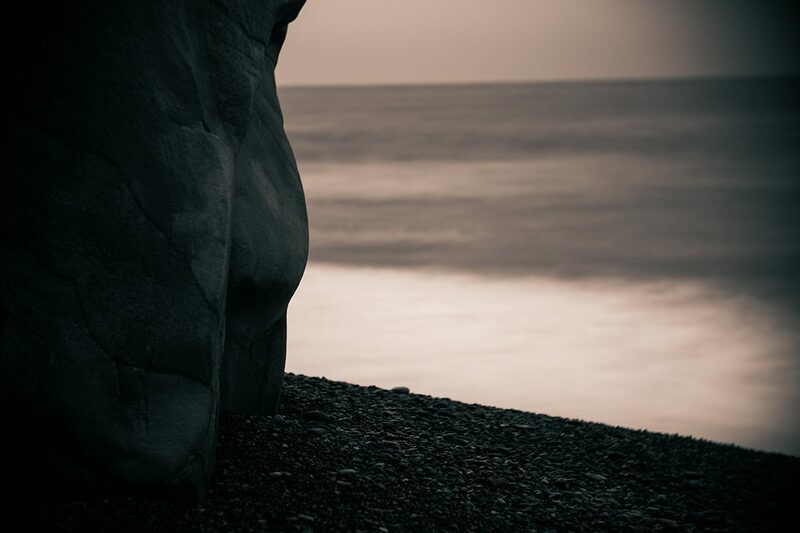 We wanted to shoot this location, but ended up retreating to the beach to look for shelter from the wind by getting behind the exposed cliffs. 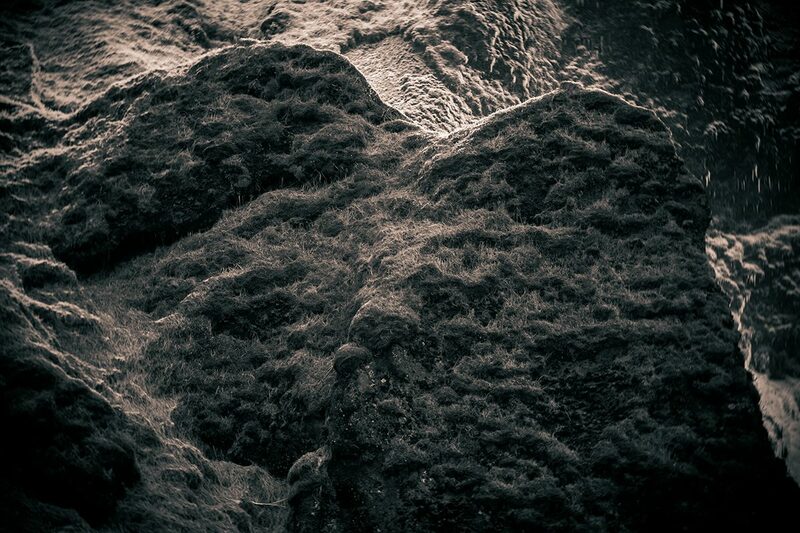 Sheltered from the wind, photographing cliff bases by the ocean, exploring the pebble beaches – we gathered our wits and made it back up to the cliffs to photograph. We lasted perhaps 45 minutes before the wind got the best of us. It was now a steady 30-40mph. 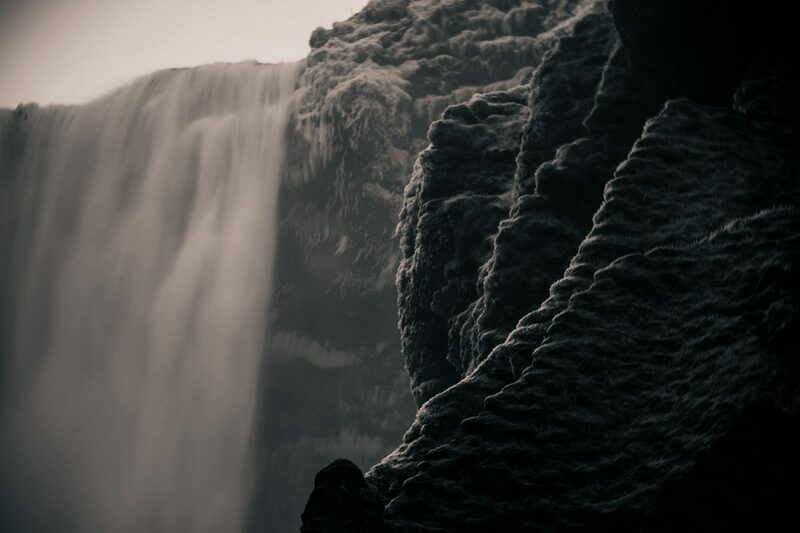 We decided to drive East towards a wonderful waterfall called Skógafoss. 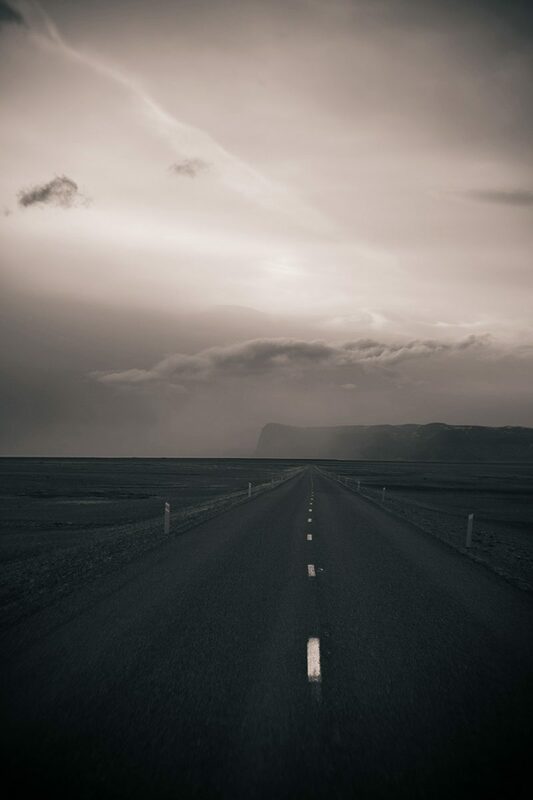 With two hours to warm ourselves and a drive across a barren landscape – it would give us our first real impression of Iceland and it’s vast landscape. Sigur Ros on the radio, and some overbearing weather system beginning to descend – we found the sun through cloud cover as thick as any we’ve seen. 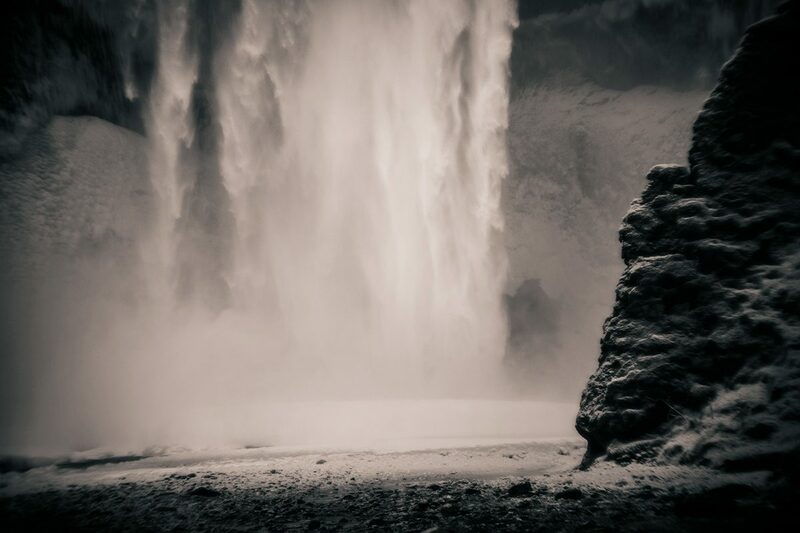 Skógafoss is one of those waterfalls that exists on every photographer’s Iceland itinerary. It’s approchable and its wonderful and in the wintertime it’s barren of tourists. I had brought a number of antique lenses with me that I have adapted to a Sony NEX-7. 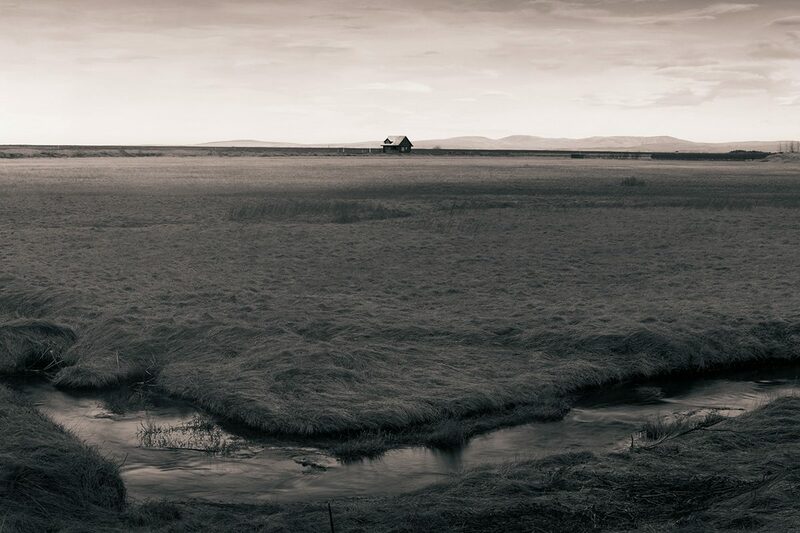 I wanted to photograph Iceland in a way that might remind me of a memory. 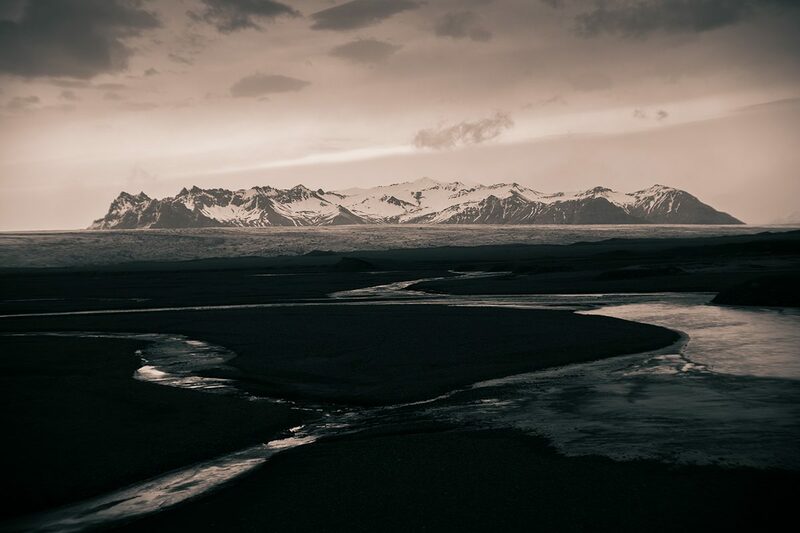 If I could have passed through Iceland on the turn of a century before – what would I have brought with me? What glass? I had a 100 year old Goerz, a fast 3 inch WWII French aviation lens, a pair of fast 1950’s Kern-Paillards, and a 1970s Leica 35mm. To bring me to present time, I had a pair of fast Zeiss wide-angles for my 5DMkII, and a Voightlander 15mm for the Sony. It was a truly inspiring day of photography. The waterfall warmed us in comparison to the coastline. But, we witnessed something that should have given us an indication of weather to come. At Skógafoss, across from the parking area in the distance we saw a smaller waterfall that was flowing up instead of down. 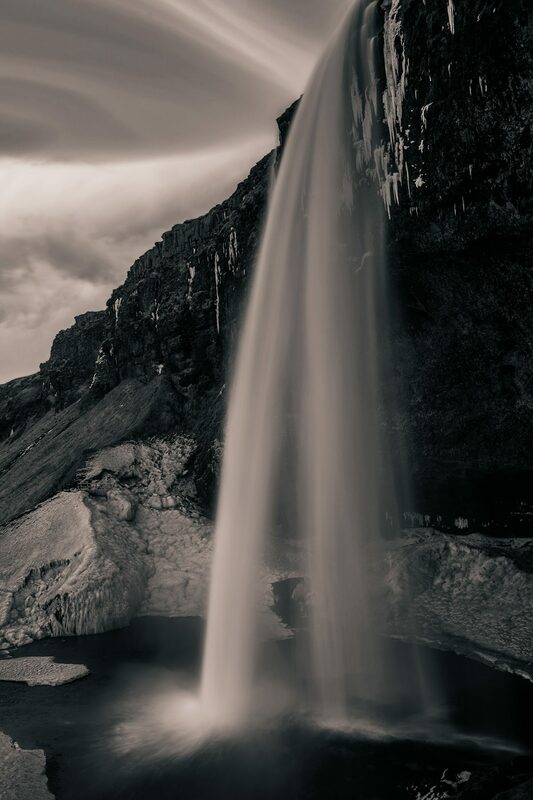 The wind was so strong that the water as it went over the cliff was pushed high into the air above the falls. It was as if gravity were reversed. Where we were standing the wind was only slight. 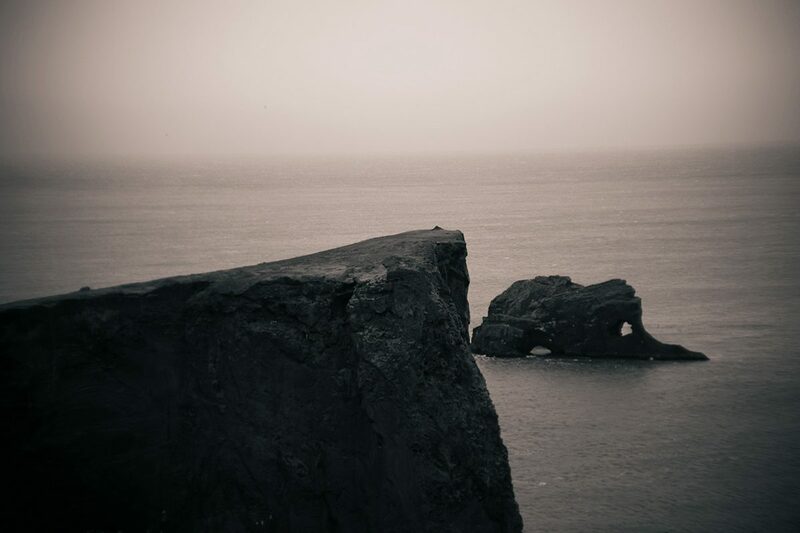 I enjoyed this place because as remote it was – there was no wind. 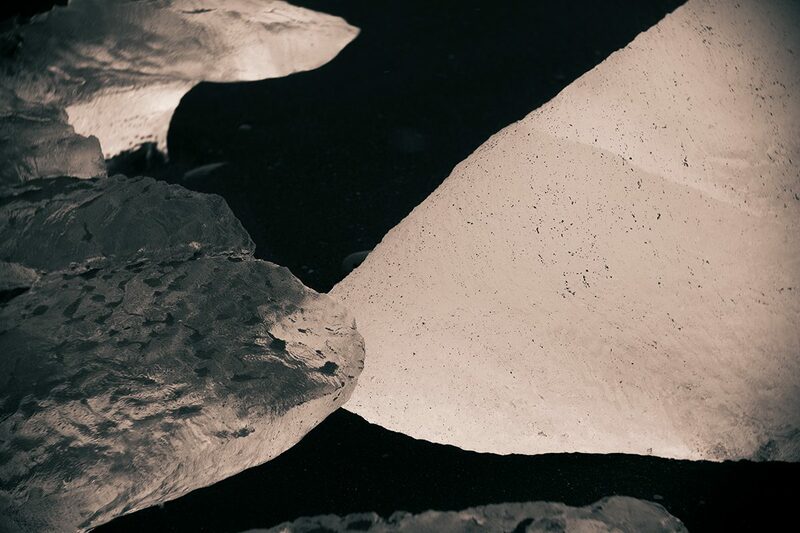 The glacier can only be as cold as ice. It was finally quiet. 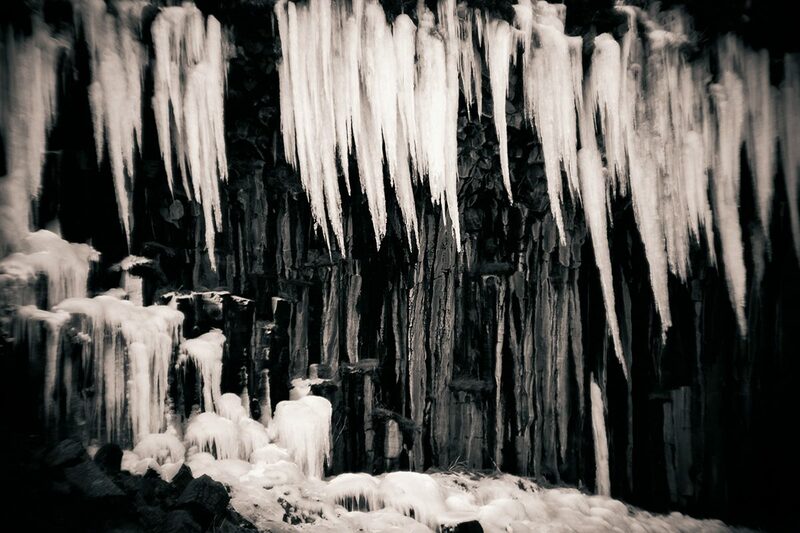 I had never walked under ancient ice. It was a maze that extended forever. And when dusk comes – anything is suddenly transformed into the best moment ever. I could be contemplative. I was finding the Iceland I had come seeking. Though the light fading and our time short – I could have returned here again and again. It was an amazing day of photography. The next morning, an unexpected blizzard arrived. The weather forecasted was light morning snow. 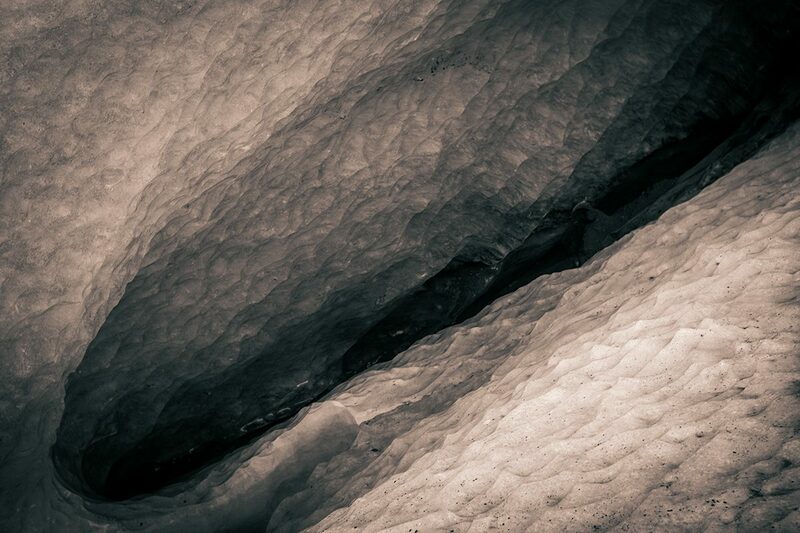 The reality was 70-100mph wind driven snow that compacted to form a texture I have never seen in snow in Vermont. For 25 winters, I have encountered many storms in Vermont. 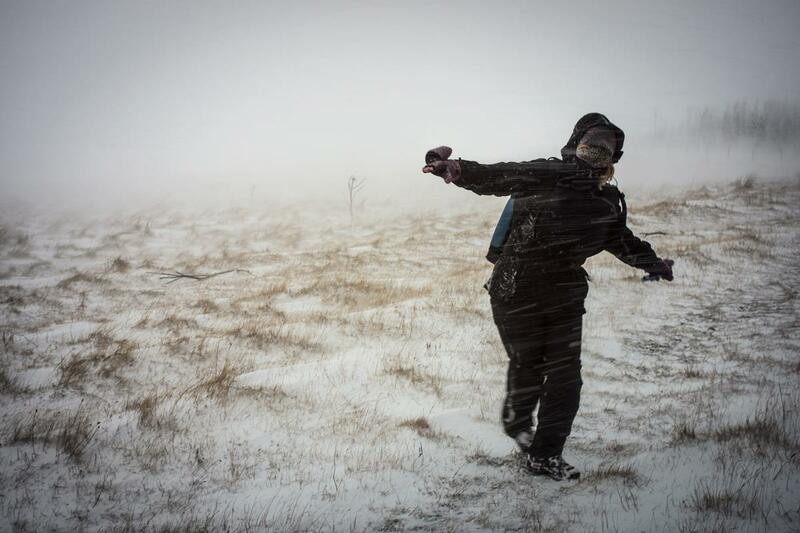 But, an Iceland blizzard is most unusual. 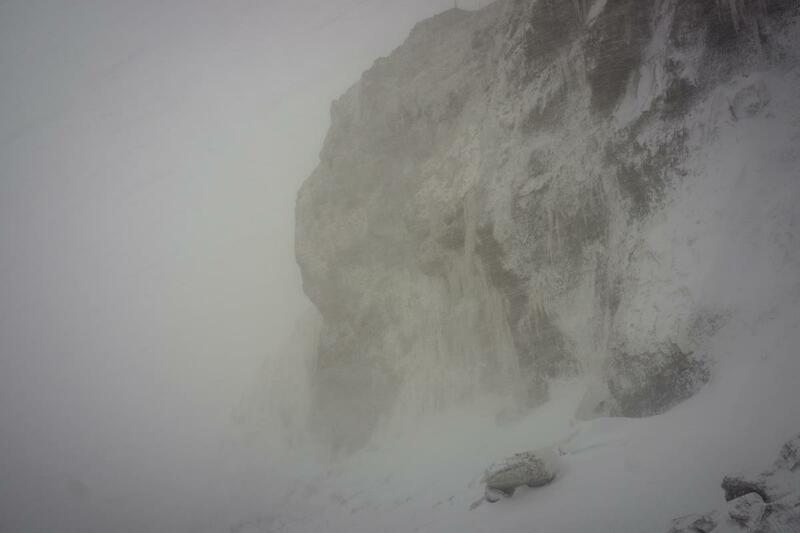 The moisture from the sea combined with strong driving winds form a snow that is more like cement than snowfall. The wind prevents it from sticking to the unique road surfaces. It just blows past. However, the drifts form over the roads, the winds turn them to ice. We limited our second day to exploring a nearby farmer’s cave, or photographing the landscape in front of the hotel when there was a momentary break in the storm. 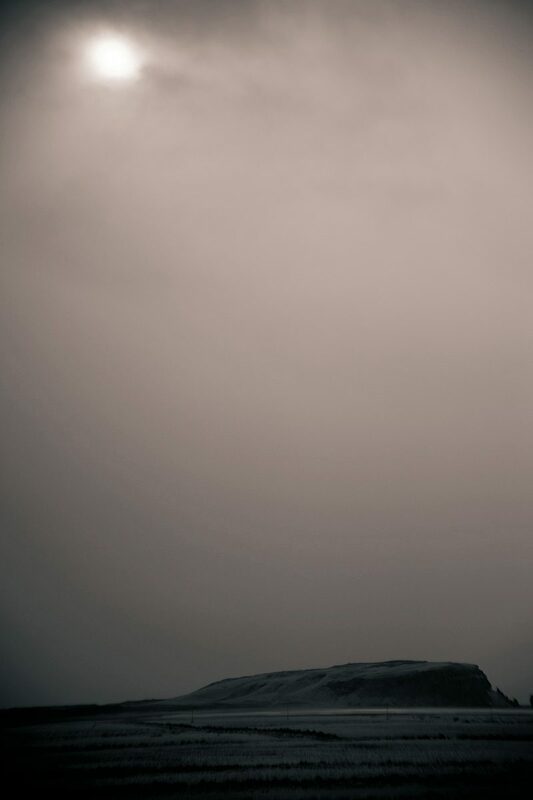 Our third day of this photographic expedition involved a morning attempt at driving in the blizzard. That was ill advised being only the 5th cart to venture onto the highway. They count cars and windspeed, etc and post to live weather maps. The amount of cars is the most accurate forecast for roads being opened or closed. 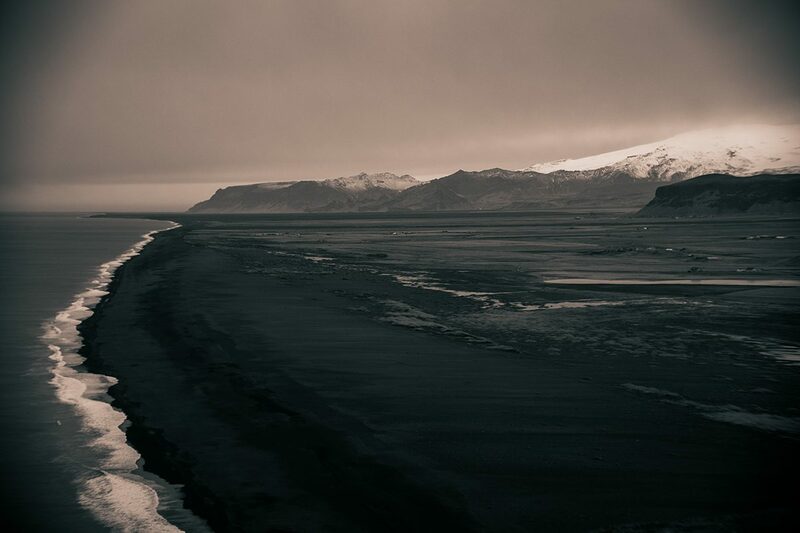 We would make it only the few miles to Vik where we found a plate of lamb stew and incredibly warm Icelandic wool sweaters and caps. 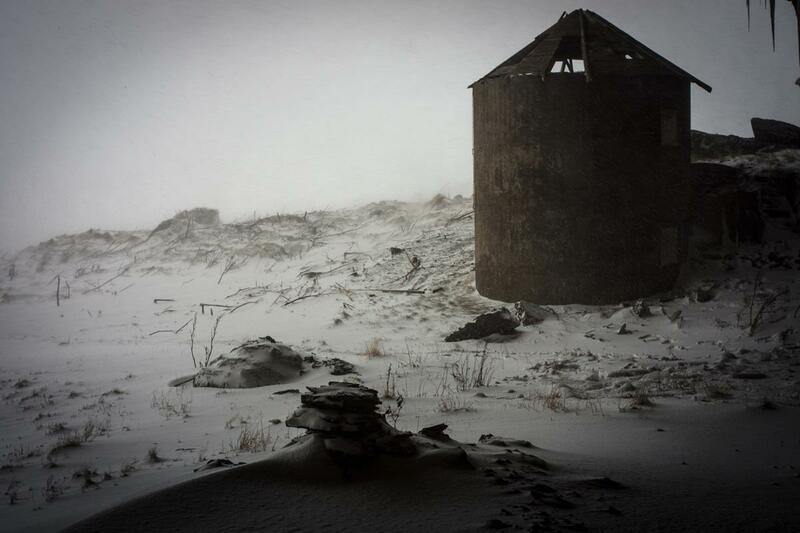 The snow in Vik was beginning to pile up to cover the first story of the houses! 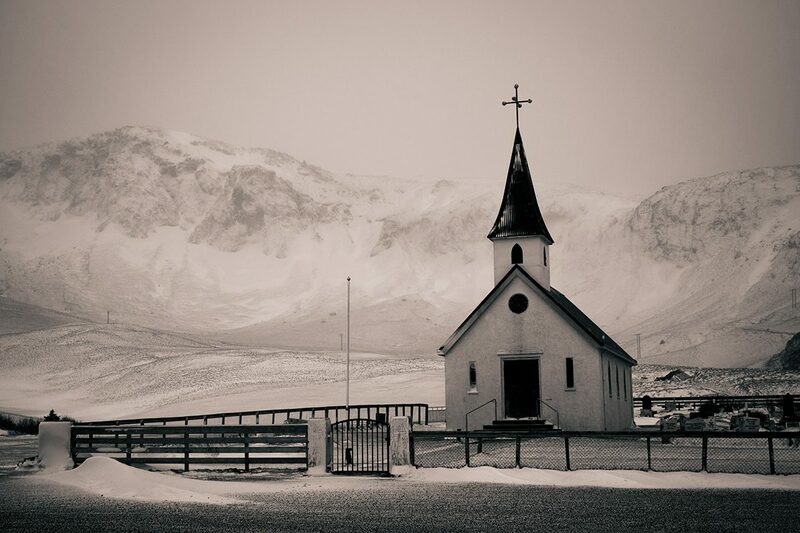 We also found a church at a higher elevation which we could drive to in Vik that was well worth photographing. 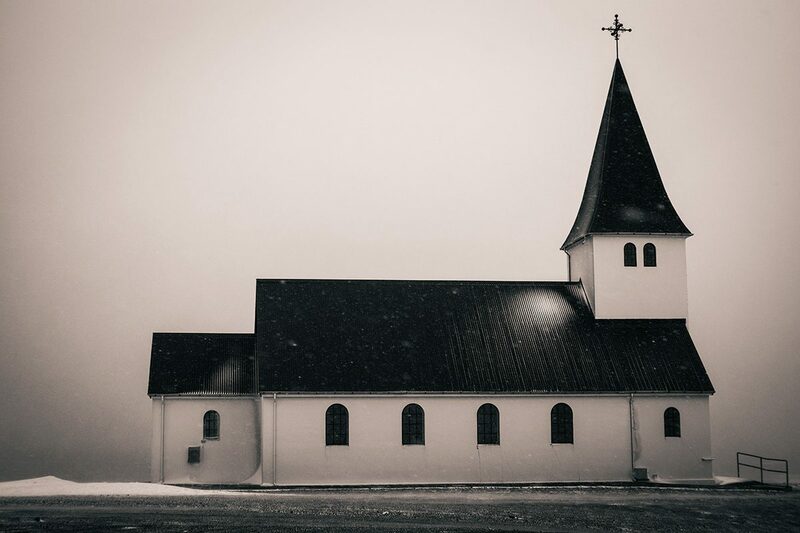 All the churches in Iceland are incredibly iconic. The snow abated just a little to allow photographing, but not the wind. We had to take turns positioning the SUV and we used the windows as tri-pods. This was classic drive by shooting. 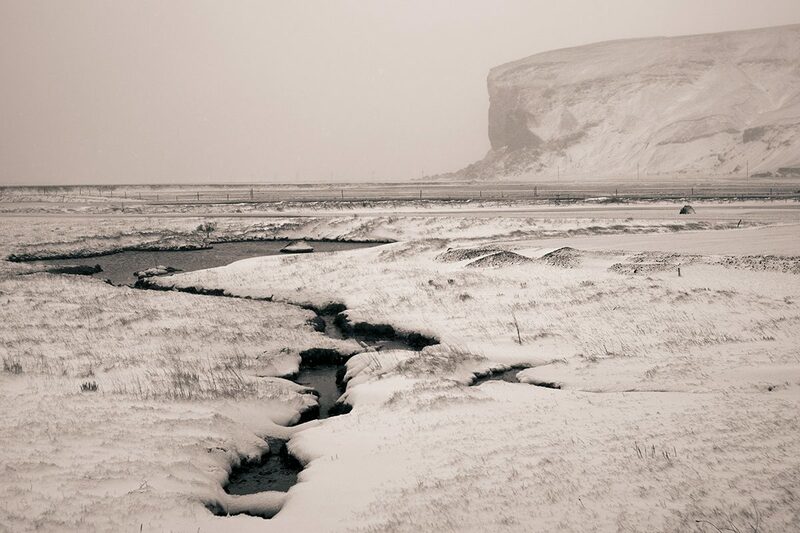 The road out of Vik to venture West again was impassible and we were forced to turn back. We made the best of it to photograph through the windows of the hotel. The next morning we punched through Vik to head West again. The town was mired up to its eves in snow. It was a welcome sight to see an official snow plow after we had been driving for miles on snow covered highways – and our confidence began soaring. 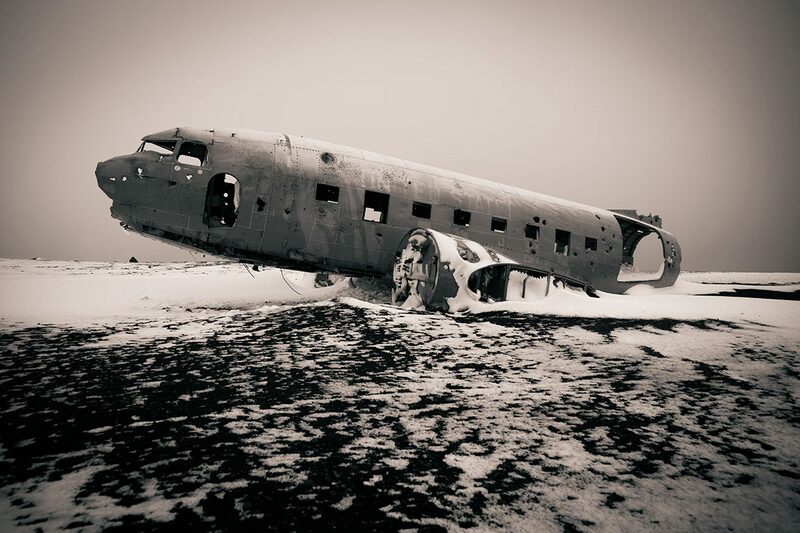 Our guide Mark Voce decided to venture off-road to look for an old crashed Navy DC3 aircraft. We went about 4 to 5 miles off-road over a very snowy and uneven terrain – stopping to check drift depths and then circumventing one hill for another. I thought we were lost. And then the DC3 found us. From inside the SUV, the bomber looked eerily like the cover of a familiar Sigor Ros album cover. But, outside the SUV the wind speeds were easily 50mph and shooting was difficult at best. In some ways, we weren’t certain if we should laugh or cry at this point. Obviously, we were not on a winter vacation to Costa Rica. But, in our minds we were both thinking – what if we get stuck out here… What if the water and the chocolate runs out. Using a tripod was out of the question. Holding the camera to the chest, keeping the wind to the back, was the only possible way of keeping possession of our gear. 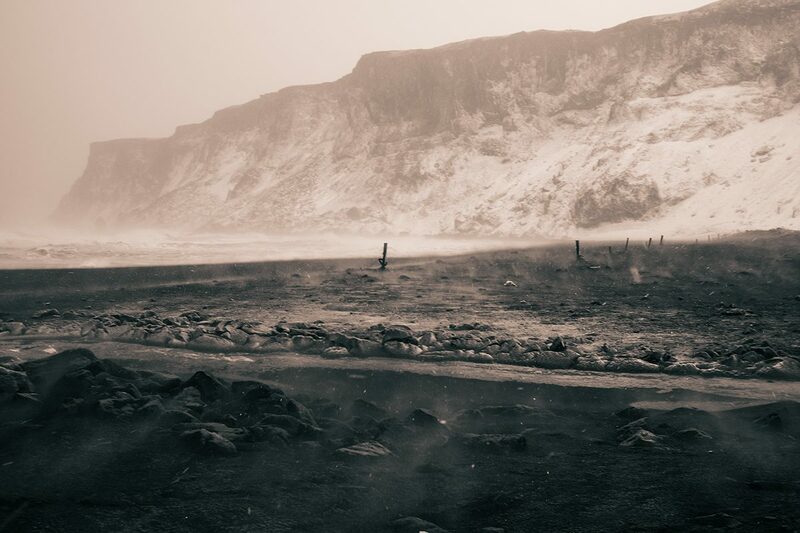 The landscape was utterly eerie. Pure white and black with a silvery gray bomber and a loud howling wind. I don’t know if we could find a more authentic Iceland moment. 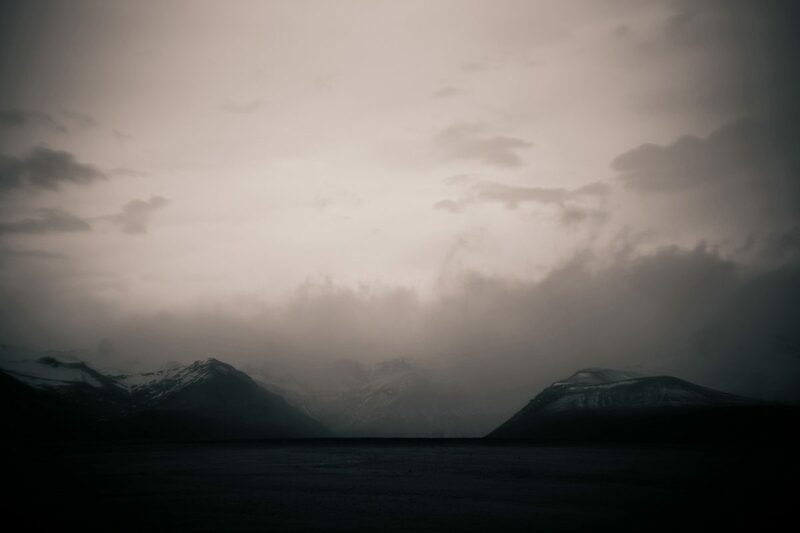 And when we tried to drive back to the highway, I didn’t know if we could find a more authentic Iceland moment. Our tracks had already been covered over by drifting snow. We had no compass. My google maps on my iPhone could not get a signal. And yet we were happy as peas in a pod, munching chocolate and drinking cool Icelandic bottled water. I have never been more happier as when we accidentally crossed perpendicular to our tracks in. We stumbled upon a way back to the snow covered highway. We would stop to photograph another church and then we would venture back to the blizzard that we had left earlier that morning. 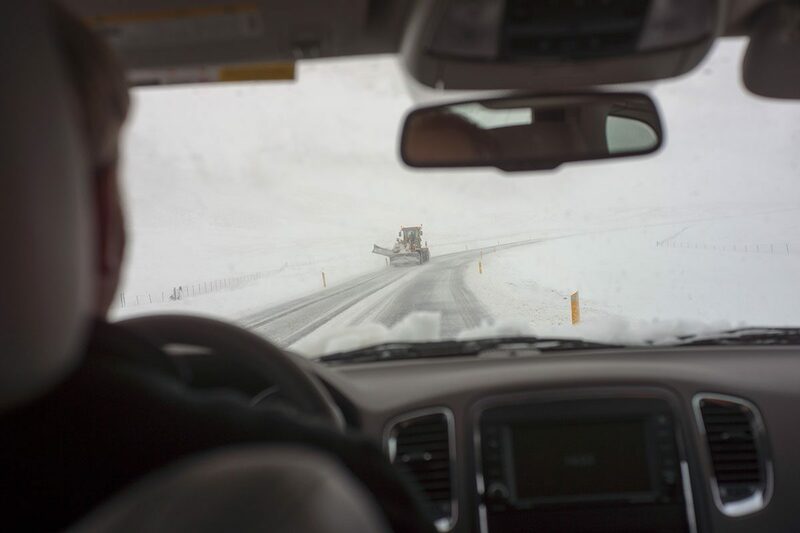 On the way back home – the roads in Vik had been cleared. The storm was still going strong and we braved 100mph gusts to photograph the beach. Cathy was picked up off the ground. We were all pelted by a constant sandblasting of the lava sand from the beach. The snow was blowing horizontally. It was one of the most awesome experiences I have had and I spent five seasons roadracing motorcycles in the USA. The weather was so extreme, what we were doing was so risky, and yet by being photographers we somehow skirted the issue of dangerous sporting events. I eased my way to the top front of the derrick to get a better vantage point and unfortunately lost my lean back. 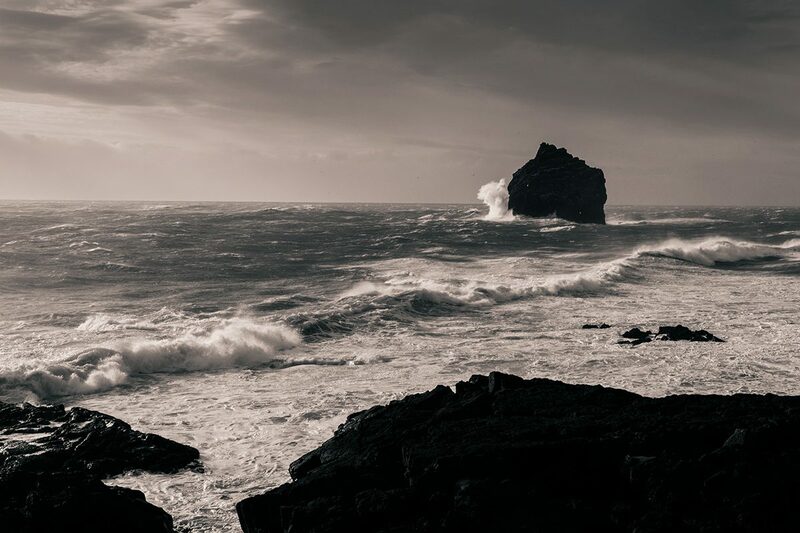 The wind drove me to a more forward postion and I felt that sensation one does when about to be pitched into the frigid North Atlantic ocean which was boiling with rage. Was time to fall backwards, let the wind pick me back up and do the reverse shuffle. It took all of my leg strength to back into the wind. I did manage to get my shot. 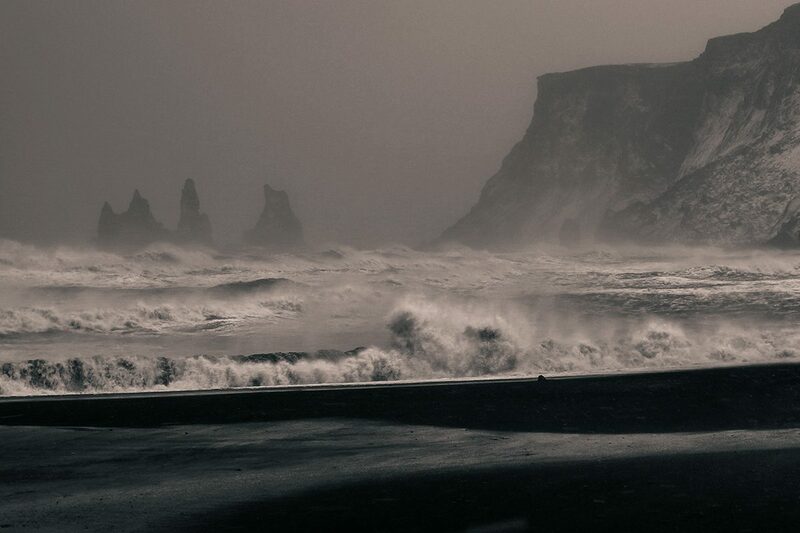 This is what Iceland looks like with 100mph wind at one’s back. 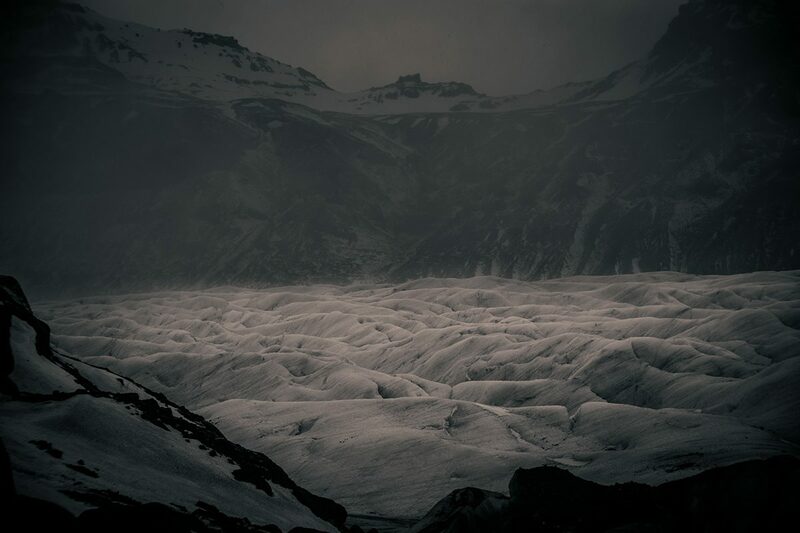 Finally, the blizzard over, we travelled the next day East this time towards one of the largest glaciers in Iceland. The landscape was fantastical. 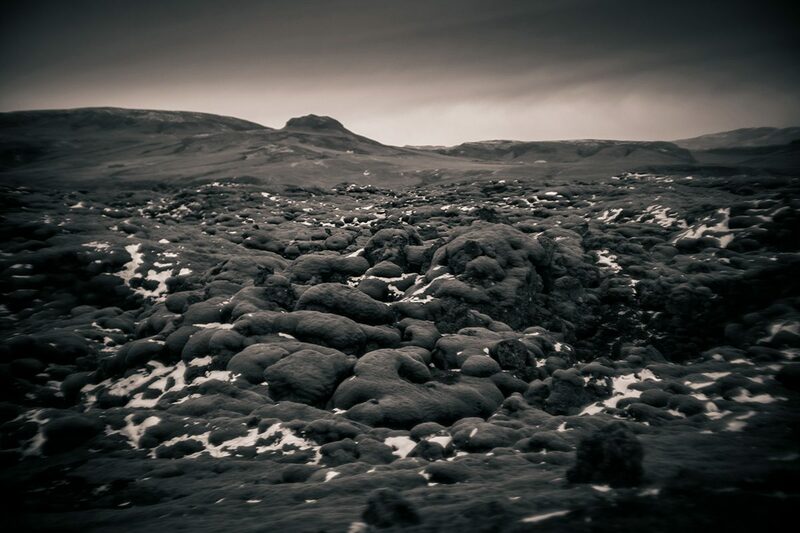 Iceland’s major volcanoes have all erupted in the past two centuries leaving behind a landscape of strange formations. Occasionally, the lava misses one farm or another – but vast stretches of farmland are rare. Ancient and modern lava beds are not. 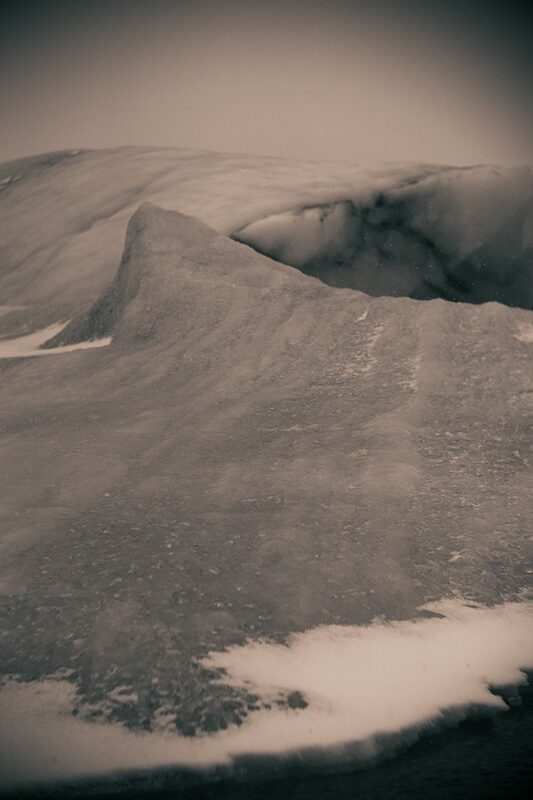 Even the occasional mountain top that has been sheared off and carried by a glacier forms a surprise in an otherwise flat expanse. 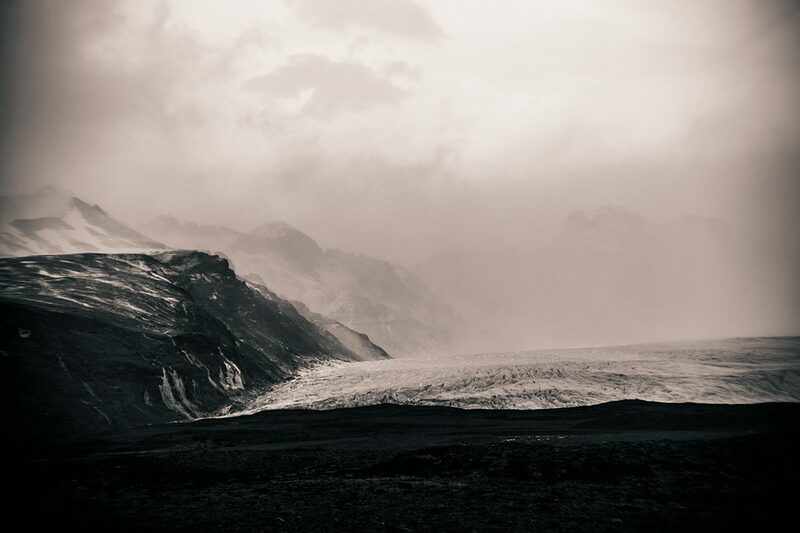 The Skaftafellsjökull glacier is so enormous that you approach it for an hour. From the distance you see it flowing between two enormous mountain ranges. It is truly something to witness. As you make your progress towards it on what seems an endless straight highway, its true beauty slowly unfolds moment by moment. 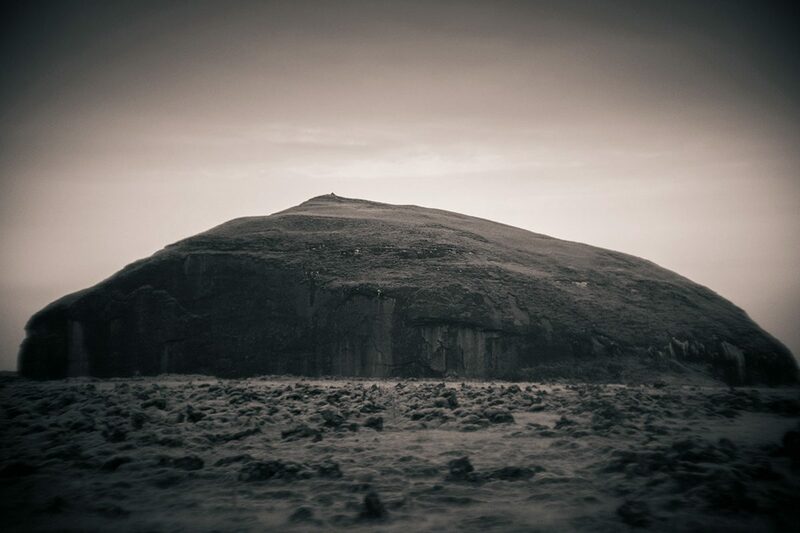 You can only stop and photograph it a few times while approaching – or you never arrive at the destination. 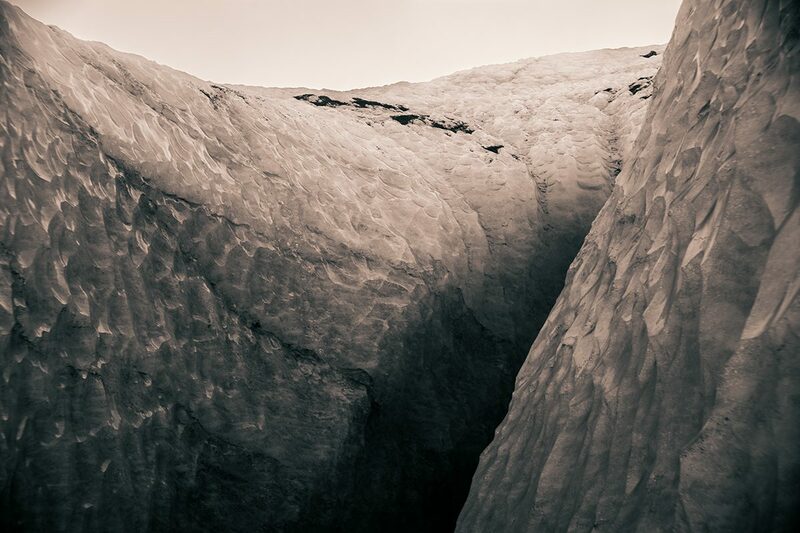 The glacier itself offers wonderful access. You can photograph it from the park. You can transverse it with the proper gear. 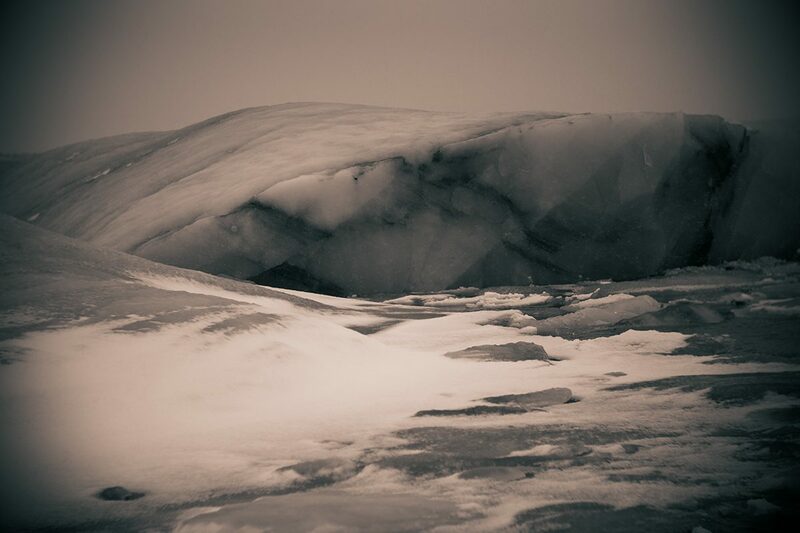 You can drive to the mouth where ice bergs are being birthed and carried out to sea. 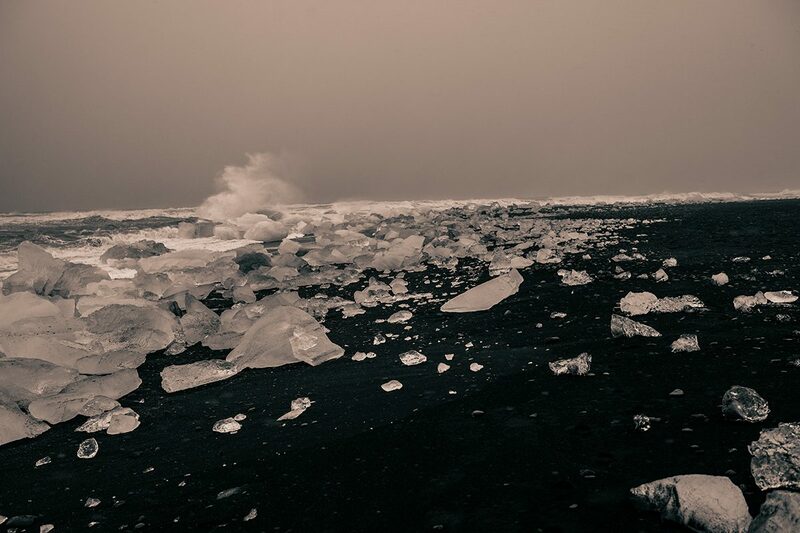 Make your way to the beach as we did to see the shards and remnants of blue ice washed shore. 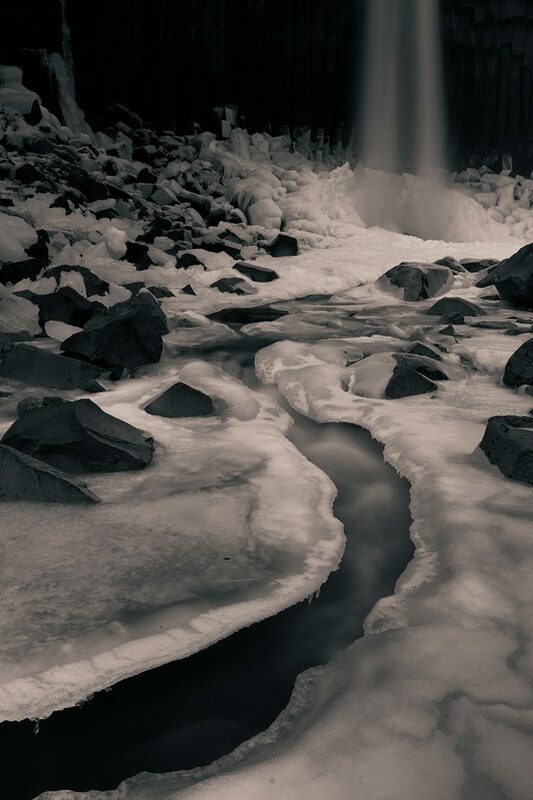 From here up into the mountains of Skaftafell park to photograph the Svartifoss waterfall. This time, the winds were lighter – just a steady 15-20 mph. The hiking was pleasant. The reward was great! 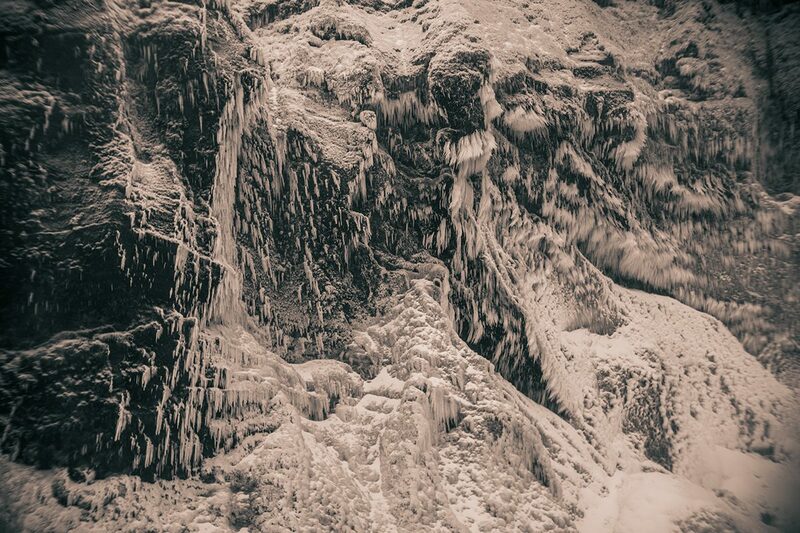 The waterfall was sheltered from all the wind. The views from the heights were magnificent. 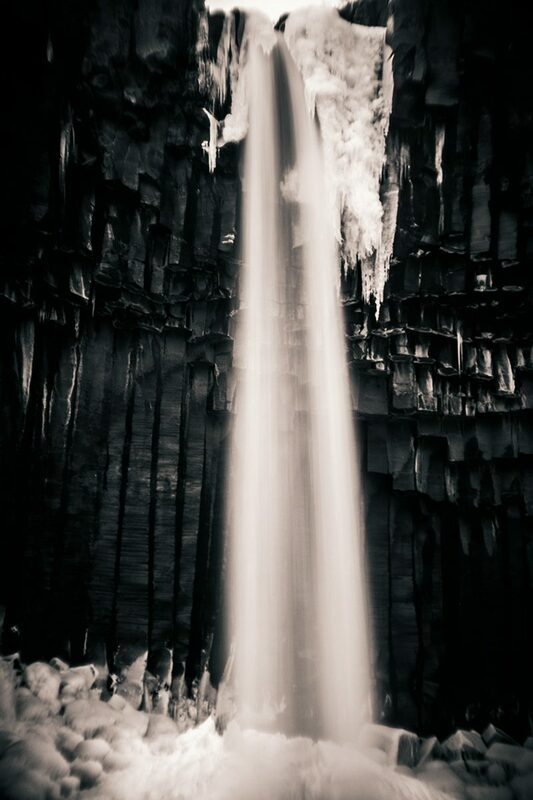 Svartifoss falls is about a 60 foot drop in front of basalt columns. How can it get better than this? It is a stunning setting. The day was well spent with the sun setting and the long twilight about to set in for our walk back to the car and the long drive back to Vik to our hotel. The next day we would have one more day of shooting while making our way back towards Keflevik where we flew in and out of. 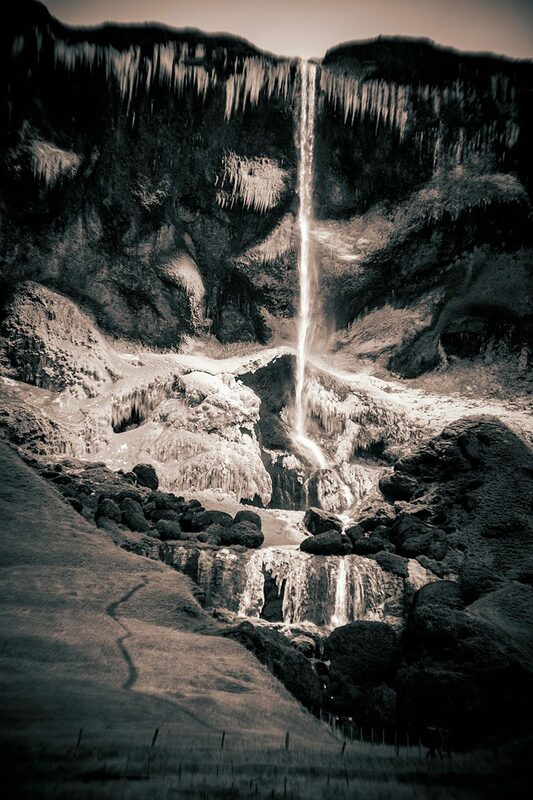 We stopped at the Skógafoss waterfall again. 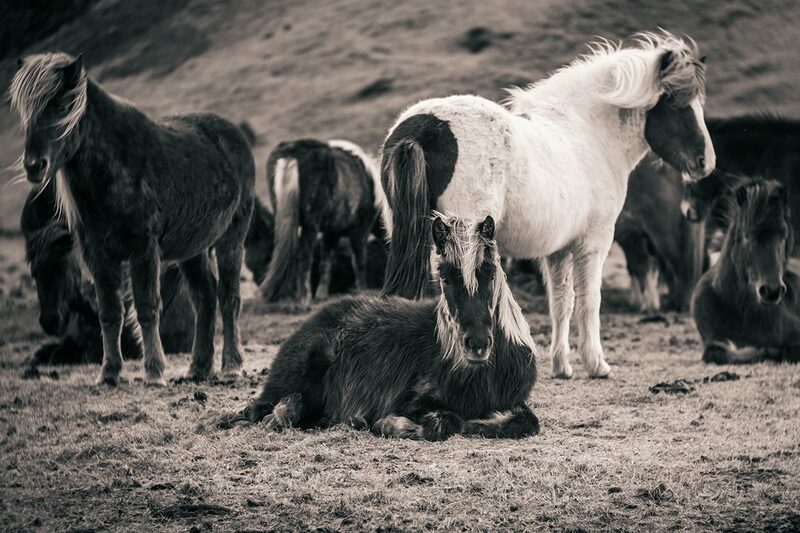 We photographed Icelandic ponies. Cathy and I ate some of the best lightly fried fish we have ever had – and washed it down with Viking beer. 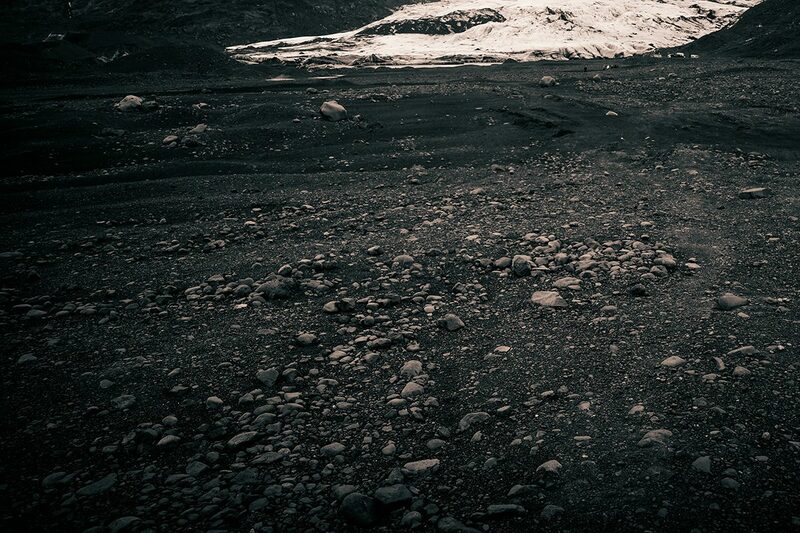 We crossed over one lava field after another to find ourselves eventually in 70mph winds again. 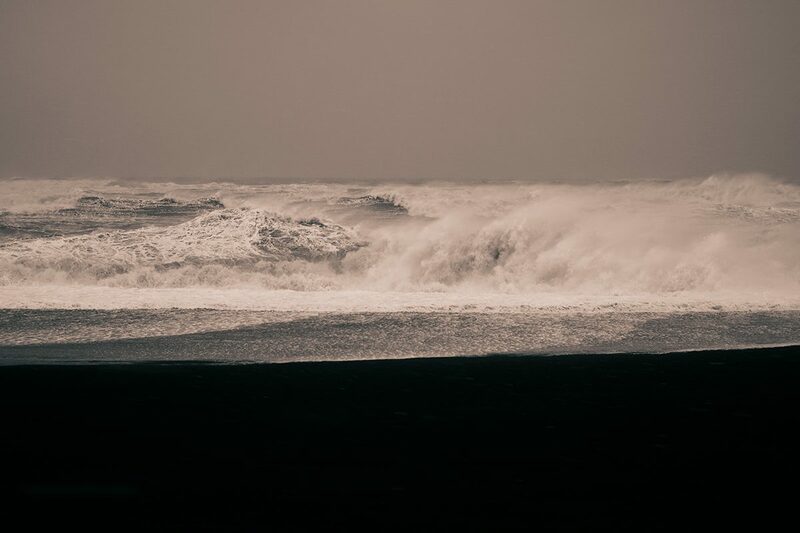 The coast around Keflavik can be very windy. This time, it was unexpected. When we stopped to photograph the cost line, the car door bent backwards on itself…leaving the typical Iceland door crease on the SUV. The wind was simply too strong. Our guide parked the car instead of into the wind, away from it. When the door handle was released from the inside, the door took off with enough force to cause damage. They do not insure doors and under carriages in Iceland. The bill for this would come from the rental agency and we would split it with our guide. Lesson learned. The wind however, was relentless. A custom frame I fitted to my NEX-7 vibrated loose from the howling wind – making it impossible to find any way to steady it against a constant pushing and shoving from the back. The wind taunting me – bullying me really… I immediately thought of Man V Food and the host giving up with just two bites of some 5lb egg omelet left to go. I thought of Héctor Camacho saying “no mas” to the referee when he gave up against Sugar Ray Leonard. That made me think of Mike Tyson biting off a bit of Holyfield’s ear in order to have his boxing match stopped. If I could have bitten the ear off this wind, I would have. All I could do was take my busted tripod and camera back to the SUV, pack it up, and give up. Cathy and I laughed. 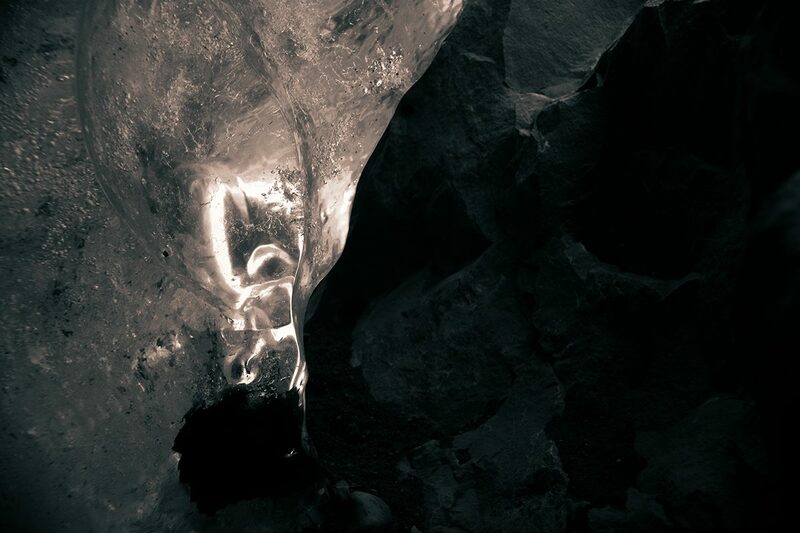 We were in a landscape dotted with foul smelling sulpher pools, in a car with a bent door. What were we doing in Iceland? Was this crazy? Was this Iceland? How do people survive here? We spent our last evening in the famous Iceland Blue Lagoon bathing in warm natural hot springs, covering our faces with silica mud. Our bodies warm, our bones warm, our hair frozen from the wind. We were happy. We were relaxed. We would have one of the best meals of our life that night. Iceland is fantastic. It can be a photographer’s journey to be sure. But, as we think back on the absolute best meals of Icelandic lamb, Arctic Char, smoked salmon, fish and chips…we realized we ate really well. We had a rock lobster bisque at a small rest stop near a glacier that was one of the most delicious things we have ever eaten. It is easy to think that frigid weather and relentless wind can cloud the mind. But, taste buds know better. Would we come here again is the question. And if we did, would it be in March when there is such an amazing opportunity to photograph with weather. I think that we would. The hotel we stayed at has a small conference room with enough space for three or four Epson printers loaded with Piezography inks. We could organize a workshop. We could eat well – venture out – and stay warmer. We know what to expect now – and how to be better prepared – and how to prepare others. There was not a tremendous amount of hiking. We photographed easily accessible places. 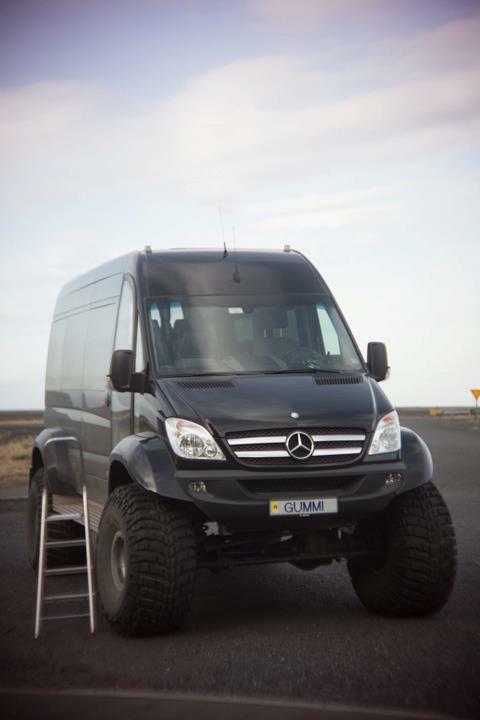 And with a much larger and more comfortable SUV like this monster Mercedes class van…..
We are thinking of an Icelandic Piezography workshop. The type where you photograph all day, eat really well, and then print into the evening hours. It’s almost a guarantee of a gorgeous portfolio. One thing for certain. When they made Iceland, they definitely had Piezography in mind. NextEpson OEM inks versus Epson 4900 print heads! 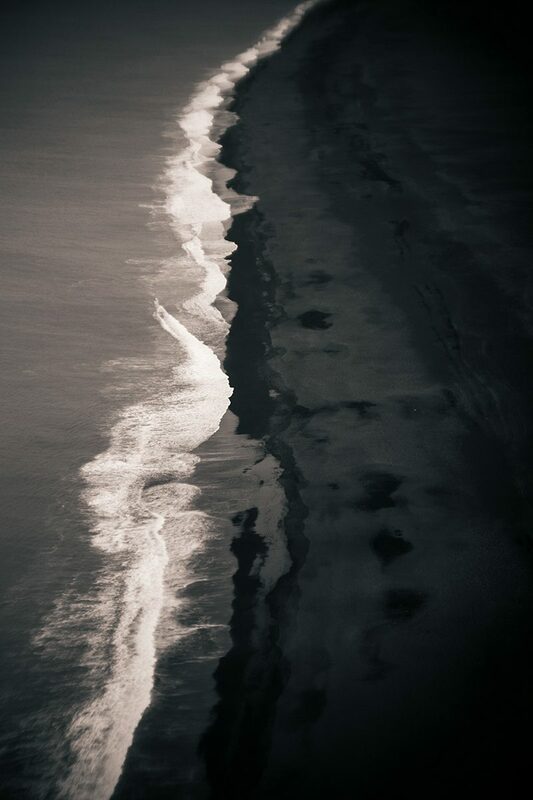 I was stationed in Iceland at the time the C-47 (not a civilian DC3) crashed on the beach. The only injury was to the Navy pilots credentials. Also you spoke of it as a bomber. In fact it is a cargo aircraft that was used to fly supplies from the Naval Station Keflavik (now the International Airport) to the USAF radar station immediately east of Höfn. Just to set the record straight. Hi Jon, you captured some lovely images. But just as a small suggestion based on your comments is this quote from my hang-gliding instructor: “There are old pilots, and bold pilots, but no old bold pilots.” No image is worth being pitched into the North Atlantic by 100 mph winds. And now that we are in blossom season, IR photography comes into its own in producing extraordinary, beautifully textured images as the white blossoms stand out against the dark sky.